We love any Mexican food recipe at our house, and I am always looking for new ways to prepare it. 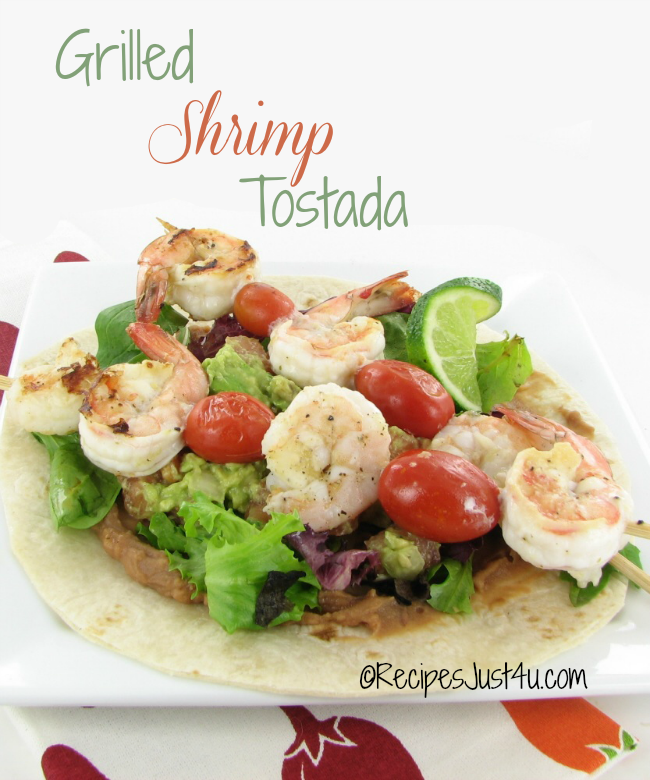 This recipe for Grilled Shrimp Tostadas is ready in a flash and combines heart healthy grilled shrimp to a traditional tostada recipe. 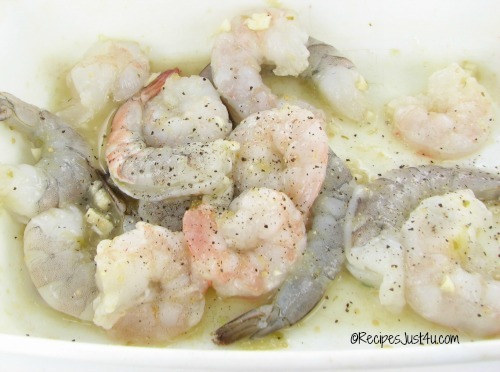 It is one of my husband’s favorite shrimp recipes. And if you are looking for easy appetizers, this recipe is for you! Shrimp is such an easy seafood to cook with. You can make it mild or add in some spicy heat and it always tastes great. (See my spicy garlic and parsley shrimp recipe for another great tasting way to use shrimp. If you are looking for 30 minute meals or appetizers, this is one that my family really loves. For these tostadas, I combined Vegetarian re-fried beans and store bought salsa verde. (affiliate links) The salsa verde is also used to season the shrimp for an extra taste delight. You can either grill the shrimp outside, or indoors on a grill. (soak your skewers first if you plan to grill outside. The recipe is done in a few stages. 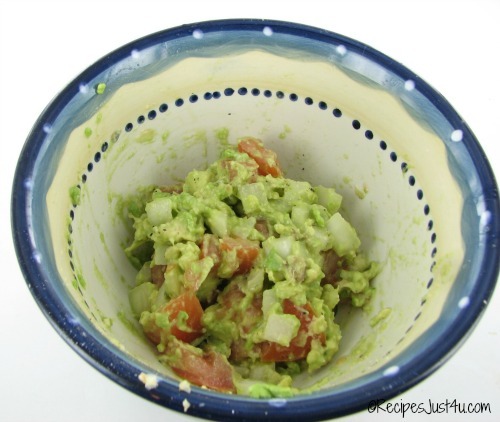 First, make your guacamole, being sure to leave some chunks of avocado in it. Then season the shrimp with garlic, salt and pepper and the salsa verde. Then thread the shrimp and tomatoes on the skewers. Then cook them for a few minutes on each side. The salsa verde on the shrimp gives them a great taste and keeps them moist and not dried out during cooking time. The final step it to layer your Mexican ingredients on tostadas and then garnish and serve. 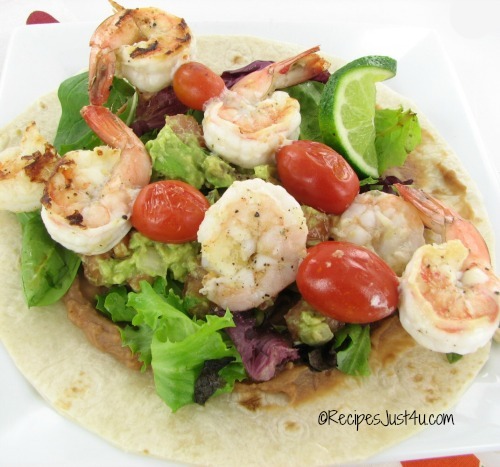 The shrimp lowers the calories of what would normally be a heavy meal and the additional tostada layers makes you feel as though you are not cutting calories too much. A win win meal! If you want you can top it with both cheese and a table spoon of sour cream, but this is optional. Super fast and easy to do, but tastes like you spent hours making it. What could be better? Grill the shrimp about 1 to 2 minutes on each side. Set aside. Place a tostada on each plate, top each with 1/4 cup of the re-fried beans and spread evenly, 1/4 cup lettuce and 1/2 of the guacamole. 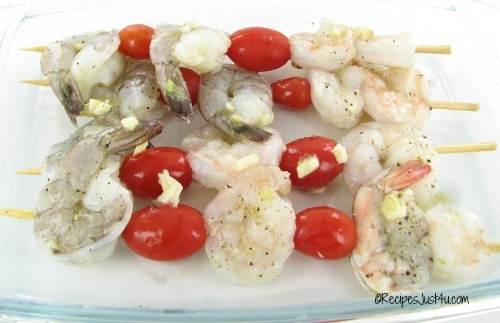 Top each with a shrimp skewer on top and serve with extra salsa verde and cheddar cheese. Recipe adapted from one I found on Skinny Taste.